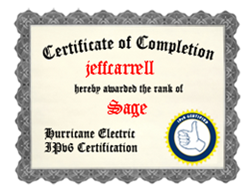 IPv6 training facilitated by Jeff Carrell, an IPv6 Forum Certified Engineer (Silver & Gold) and an IPv6 Forum Certified Trainer (Gold). This is an IPv6 Forum Certified Course (Silver) that is comprised of approximately 50% lecture and 50% hands-on labs, spanning 3 full days. This course can be delivered either on-site or virtually. A remote access IPv6 hands-on lab system is used in either delivery method, requiring the participant to have a computer, a Java enabled browser, and an Internet connection. The course information and outline is available here. This is an IPv6 Forum Certified Course (Gold) that is comprised of approximately 50% lecture and 50% hands-on labs, spanning 4 full days. For additional information, contact Jeff Carrell.